This has been an exciting year. My gallery in Ocala has done well enough to keep the doors open another year. There were plenty folks telling my partner Sharon Crute and I that it was a bit fool hardy to open in this economy. Yes, we have had struggles but we have survived. We've learned a lot about business, the public and ourselves. One important lesson we learned the hard way was not to run the gallery like a classic retail store. The first year we committed to long hours, 11 am - 6 pm. Wednesdays through Fridays. This put a strangle-hold on us as artists...our temprament did not fit with that kind of strict schedule. We changed our hours to 2 pm - 6 pm Wed - Thur. making a huge difference in our lives. And, our clients don't seem to have been affected. I am look forward to a wonderful year # 2. Sales through the holidays were great and I have several commissioned lined up. You will be hearing about my busy show schedule as things continue to develope, the first being at Thornebrook Gallery in Gainesville titled "Southern Exposure". I really liked this frame when I saw it in the frame shop so, I bought it not knowing what I would paint and mount in the tiny opening. After much consideration I decided cabbage palms would be perfect. The painting itself is only 3"x3", painted in oil on board. 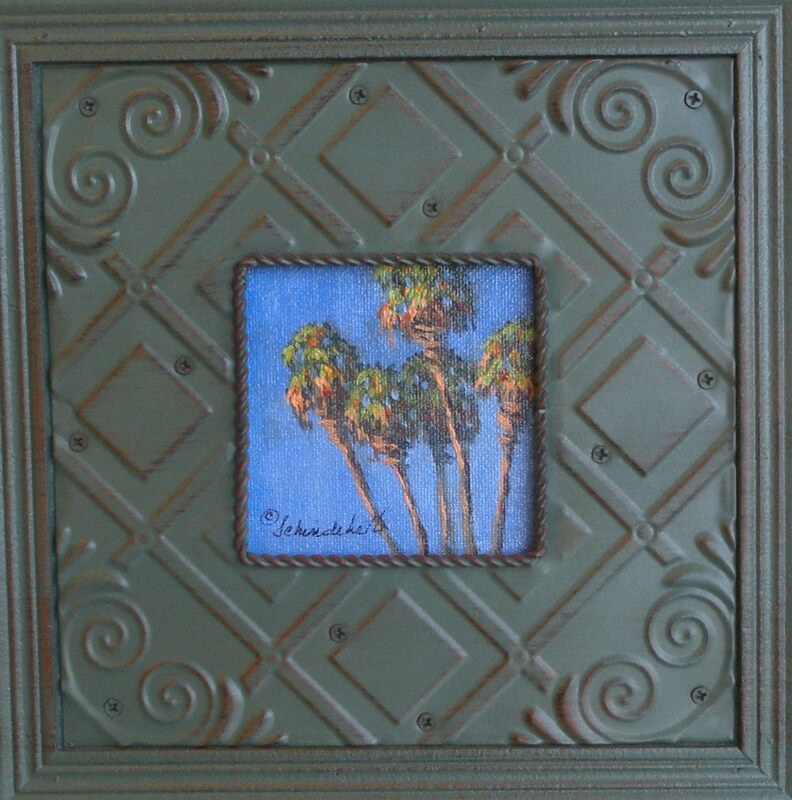 Since the painting was created specifically for this frame they are offered together for $95. Yesterday I posted Painting #3 on Face Book but forgot to enter it in my blog. So, here it is. This bromeliad was growing in the Polisak Museum & Botanical Gardens in Winter Park. I painted a larger version during the Plein Air Event last March. 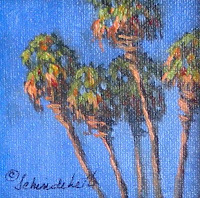 This one is 5" x 5", painted in oil on Gallery Wrapped canvas. I enjoy painting the "leaves" drapped around the sides of the wrapped canvas. This painting sells for $65. Contact me if you are interested in adding any of these miniatures to your collection of to give as a unique gift. 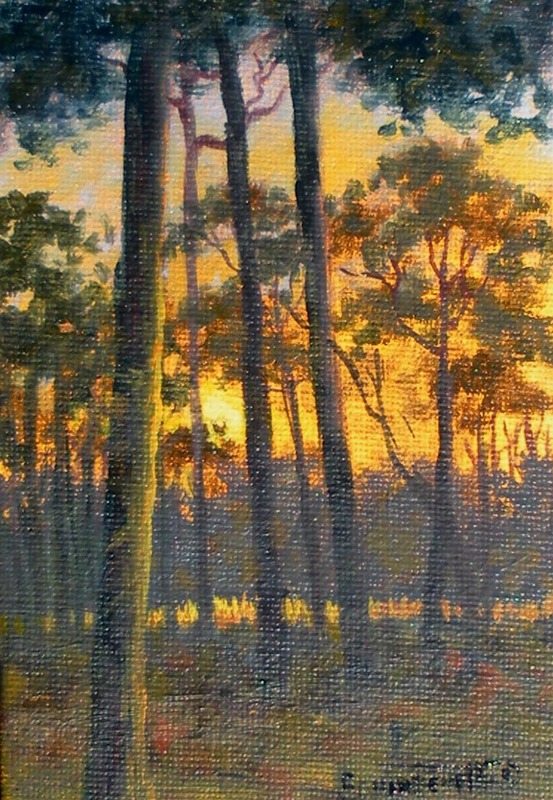 "Sunset Pines" was inspired by evening sunsets at Wekiva Springs State Park in Apopke during the Plein Air Event last March. It is 6" x 4" painted in oil on board. You can see Pines at VoilART! Gallery + Studio in the "Merry Little Minis" Holiday Show and Sale. 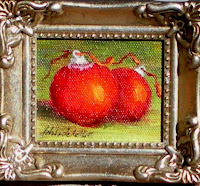 All the paintings are priced for gift giving--or collecting for yourself. And guess what??? All last minute shoppers are getting 20% OFF their total purchase at the gallery until Christmas Eve. Skip the hectic crowds at the mall. Come by the gallery...relax and enjoy complimentary coffee and yummy cookies as you select a unique gift of art for everyone on your list. These are the last of the Christmas ornaments. I added the lucious gold bulbs to the collection because I cannot get any more blue bulbs. Now you have a choice of the two colors as well as different bird poses. But when these are gone there will be no more for this year. I was excited to find this dark blue ornament. 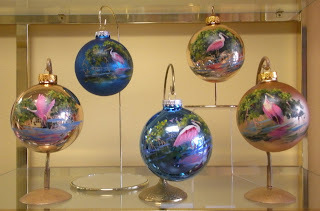 It is the same deep blue as the "White House" ornament so I knew the Roseate Spoonbills would look great on it. The bulb is much bigger than the ones shown above allowing me to paint 3 birds on it. There is only one of these and it is available. 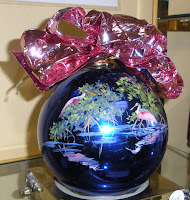 You can see all the ornaments at VoilART! Gallery in Ocala. If you want to order one just let me know. My "White House" Christmas ornaments have been well received. All the ones I painted to prepare for the holiday sale have found homes with new and past collectors. I was pleased about one ornament in particular because the buyer wanted it for his tree devoted to hand made ornaments created by painters and artisans. I have several more orders to fill and went to the store to purchase the bulbs. The wall filled with hundreds of boxes of ornaments had dwindled down to a small section. I was very distressed about not finding any of the lovely blue bulbs I had been using. After a lengthy search I found one single box of four! So, I chose a lucious gold bulb to hand-paint with Roseate Spoonbills and mangroves to finish out this season. The gold certainly adds a touch of elegance. As soon as I can get these new ornaments photographed I will post them for you all to see. I like to sit little decorations on tables and bookcases in my home during the holidays. Seeing people as they find those little pieces of holiday cheer in unexpected places is a lot of fun. 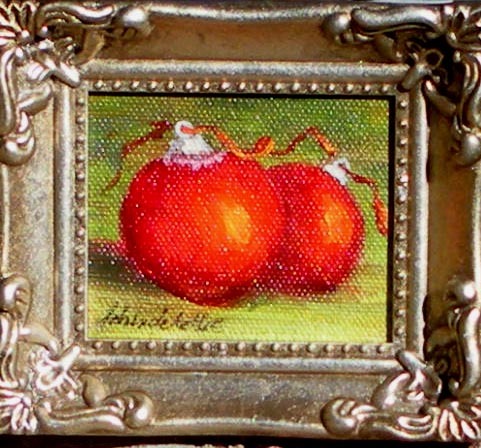 So, I want to share that idea with you all through this tiny painting with red ornaments and ribbons. 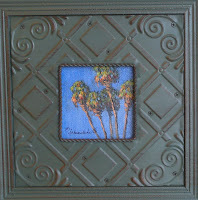 This is a week long auction in the "Post Cards from Paradise" series. 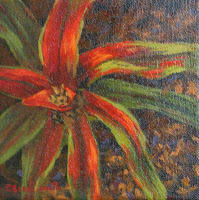 The painting is 2 1/2" x 3" painted in oil on panel. The frame is included this week so you can give it as a gift or immediately put it on display in your home. Happy bidding and I wish you a wonderful holiday season!! !